Three weeks into the new year and I have my first FO! Given that last year I finished a total of THREE FOs I’m over the moon about this. The colors are awesome and I love the way it twirls at the bottom. This is my favorite way to wear it so the ends aren’t too long and get in the way of everything. 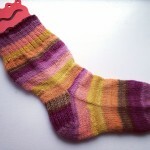 Garter stitch and wildly variegated handdyed go together so well. 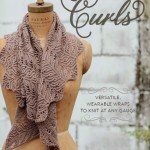 I of course have been stalking ravelry for more ideas as well as the Miss Babs site. I’ve held strong so far. I only made one mod – instead of kfb for the ruffle increases I did a YO and then I knit the YOs tbl on the next row. I just didn’t feel like doing all those kfb’s. I did the plain BO because I didn’t think you’d notice the picot BO with this yarn and let’s face it – picot BOs take FOR. EVER. 600 sts of picot bind off? No thank you. Once done I washed it in the machine on delicate and tossed it in the dryer on low temp for 15 or 20 minutes. It came out perfectly and I love that I can easily wash it to freshen it up. I end up wearing it this way a fair amount of the time because it’s quick – just put around my neck, tie it and go. And here you can see the colors up close as well as that pretty BO. 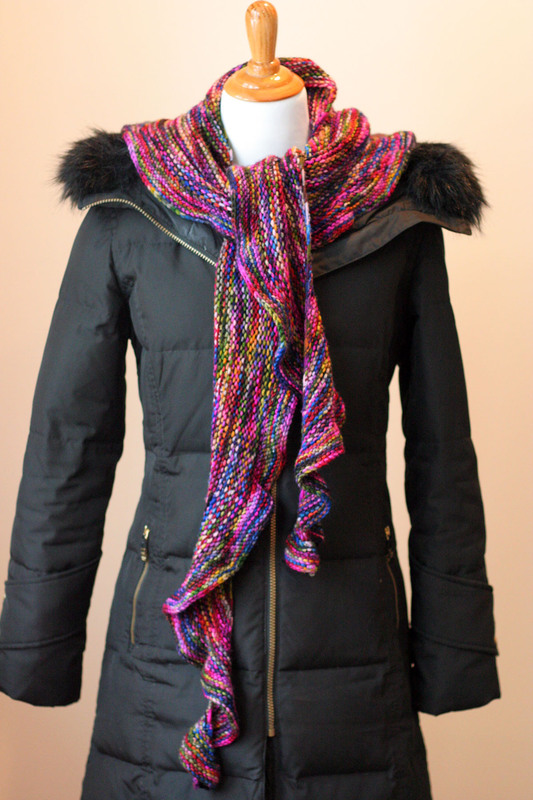 I just did a regular BO – the prettiness is all in the yarn. I got this coat in the late summer because I thought I’d be able to wear more accessories with it. So glad I got the black! FOs, shawls, scarves and cowls miss babs, shawl, susan b anderson, yowza. permalink. This is great! 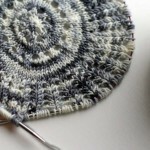 And I so agree with you about not doing the picot edge! thanks! i do think it can be worth it and be really pretty. i just didn’t think this crazy colorway would show it. Yay to the first knit of the New Year! So pretty. 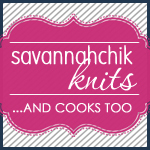 thanks – it’s a great knit and Yowza is awesome! It looks beautiful and fun too, with all those bright colours! thanks – the dyeing is really fun and fabulous. how can you be in a bad mood with all those pops of color? It’s absolutely gorgeous! That shawl is definitely going into my queue. 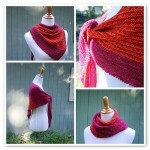 I just finished up a Denver Cowl in the Coffee Break colorway — this is inspiring me to get another variegated skein. 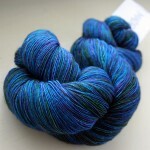 (In April… I am still stashing down after all)… Anyway, beautiful FO! Thanks! 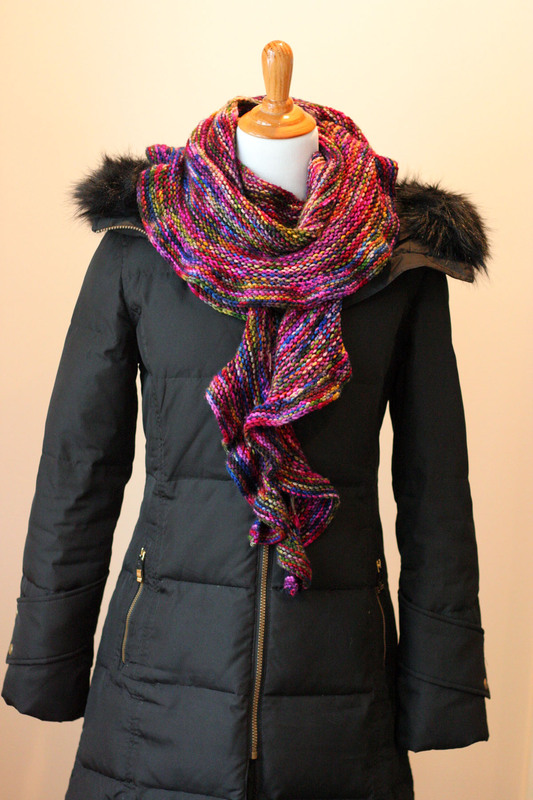 I’ve been eyeing the Denver cowl. What do you think? Yay you finished it! I love the colors and you are right – that twirl is awesome. 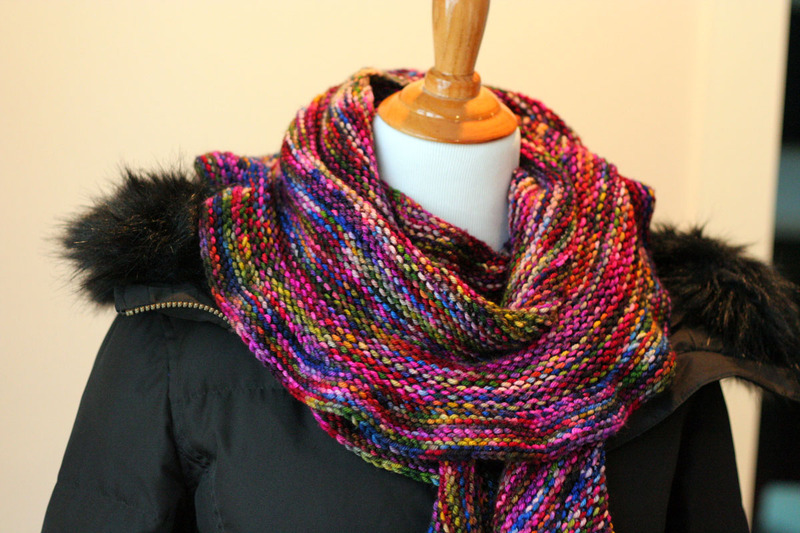 I love variagated yarns – they are so fun to work with! !